The Department of Justice inspector general identified a number of instances where FBI employees regularly spoke with members of the media and received a number of free perks from journalists, including meals and tickets to various events. In the following paragraph, the IG implies that such benefits could have encouraged various agents to leak information to the press. 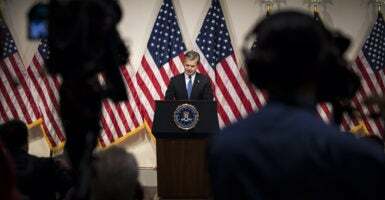 “The harm caused by leaks, fear of potential leaks, and a culture of unauthorized media contacts is illustrated in chapters ten and eleven of our report, where we detail the fact that these issues influenced FBI officials who were advising [James] Comey on consequential investigative decisions in October 2016,” the report states. According to charts provided in the IG report, one reporter had contact with 12 FBI officials, including an FBI executive and unit chief. Another reporter contacted an assistant director 21 times and a special agent 23 times, according to the IG. Some FBI employees were in contact with multiple reporters, with one special agent contacting various journalists 32 times. Such a finding by the IG helps shed light on how various information has reached outlets like CNN or The New York Times throughout the criminal investigation into former Secretary of State Hillary Clinton. One of the striking findings from the report is how senior officials within the organization had no problem speaking with the media and breaking department policy—and possibly receiving goods in exchange for that information.